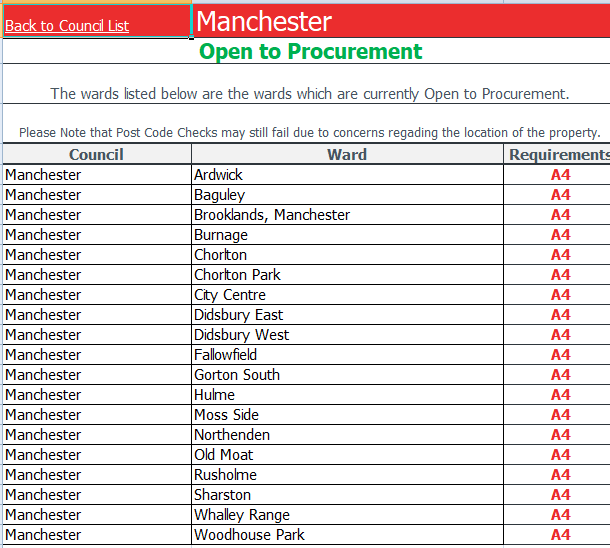 Has anyone had any experience (and success of failure) with getting Article 4 permission from Manchester City Council to convert a house to a HMO? Any tips on increasing chances of success? I'm considering buying a house with the view of converting to an HMO. What does "open to procurement" mean? Really? That is very interesting. Some of those are areas that I'd been told "no chance" by the estate agent quite recently. Is this list the result of a recent review? That is because I house aslylum seekers and the postcode can fail due to being an anti social area. What's the link to this one please?